Directions Do not take more than directed unless advised by your doctor. The bottle top is a measuring cap marked to contain 17 grams of powder when filled to the indicated line (white section in cap). Adults and children 17 years of age and older: Fill to top of white section in cap which is marked to indicate the correct dose (17 g). Stir and dissolve in any 4 to 8 ounces of beverage (cold, hot or room temperature) then drink. Use once a day. Use no more than 7 days. Children 16 years and under: Ask a doctor. Store at 20 degrees - 25 degrees C (68 degrees - 77 degrees F). Uses Relieves occasional constipation (irregularity). Generally produces a bowel movement in 1 to 3 days. 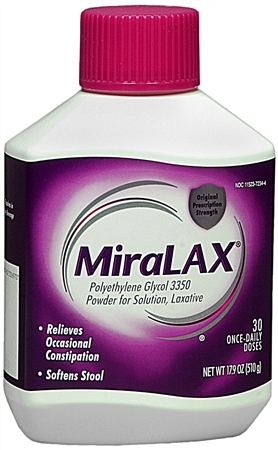 MiraLAX increases frequency of bowel movements and softens the stool. Dissolves in any beverage. Warnings Allergy alert: Do not use if you are allergic to polyethylene glycol. Do not use if you have kidney disease, except under the advice and supervision of a doctor. Ask a doctor before use if you have: nausea, vomiting or abdominal pain; a sudden change in bowel habits that lasts over 2 weeks; irritable bowel syndrome. Ask a doctor or pharmacist before use if you are taking a prescription drug. When using this product you may have loose, watery, more frequent stools. Stop use and ask a doctor if: you have rectal bleeding or your nausea, bloating, cramping or abdominal pain gets worse. 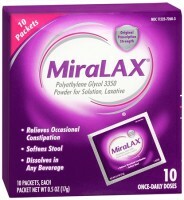 These may be signs of a serious condition; you get diarrhea; you need to use a laxative for longer than 1 week. If pregnant or breast-feeding, ask a health professional before use. Keep out of reach of children. In case of overdose, get medical help or contact a Poison Control Center right away.